I found this meme via SueBob (and others) and decided it was a good way to end the year. Tomorrow I'll start the new year with the photos I keep promising. Dyed my hair blue. Gave up caffeine and STAYED off it. I'm not one for making resolutions, but I thought the year went pretty well as far as meeting general goals. No humans, but we lost our cats, Kato and Friday. I only traveled within the U.S.: Chicago, Los Angeles, San Jose and St. Louis. Well, more money would always be nice. I'd also like to do my best to NOT fill up every moment of spare time with activity. Some downtime would be good and healthy for me. My birthday celebration was notable and memorable. I also really enjoyed BlogHer (it was my first trip to Chicago) and the Ford-sponsored trip to L.A. I'm pretty happy with all of the home improvements we did. They're not a direct achievement in that I paid someone else to execute them, but I love the way they turned out. Letting my original band project languish. There's no excuse for my not having finished the lyrics to the first two batches of songs. The chronic acid reflux is still an issue, but it's under control with medication - particularly since I stopped drinking caffeine. Most of my coolest new things were gifts: camera, iPod Shuffle, Xena the (former) kitten. My husband is really making me proud with his recording studio business. In less than a year, he's taught himself an enormous amount about the technical and artistic aspects of recording engineering and production and he's slowly but steadily building a client base on word of mouth alone. I think this coming year will be quite positive for him. Every politician in power right now, including the ones we recently elected to put a stop to all of the craziness of the past seven years. Bills, bills, bills. And food. Three reallys, huh? I don't think I'm capable of getting that excited about anything. I was actually more into new music this year than usual. Some memorable songs: "Side of a Bullet" by Nickelback, "I'm Not Going Away" by Ozzy Osbourne, "Ladies and Gentlemen" by Saliva, and the whole "Ten Thousand Fists" album by Disturbed. About the same or possibly slightly poorer. Hanging out with the family at my sister's house. Yes, with our new kitten, Xena, and our new cat, Velvet. My favorite new TV program is Pushing Daisies. No. I like to follow my Great-Aunt Edith's dictate, "We don't hate anyone...except Hitler and the Devil." I wasn't as involved in book clubs this year as last year, but I remember enjoying "Water for Elephants" and "Special Topics in Calamity Physics." That's cheating, though, because those are both books I've read recently and I can't really remember what I read earlier in the year. I'm enjoying Lacuna Coil, whom I didn't discover until this year. One of my goals was to cook dinner at home more often, and I achieved that (up until the past few weeks). I wanted my grandparents' estate to be settled once and for all, but it doesn't seem to be happening before the end of calendar year 2007. I didn't see very many movies this year, but I noticed that I'd reviewed "Grindhouse" quite positively. This was actually the weekend before my birthday, but I went with my sister and two friends to a town about an hour away and spent the night at a bed and breakfast in an old mansion. We had a great time. As for my age, that's not something one asks a lady. An hour more sleep per night. 14-year-old boy (t-shirts, jeans and Converse sneakers). Family, friends, blog buddies, co-workers and kittehs. I've got nothin' for this one. I'll steal SueBob's answer: Access to health care. My late grandparents and mother. Even if you're only counting bloggers, I met dozens and dozens of cool people this year. It seems the older I get, the more I enjoy meeting new people. I'll go with Joe Walsh, "I can't complain but sometimes I still do." That's a lyric that'll always be appropriate and timeless. Linda at Sundry Mourning is tracking the responses to this meme, so if you decide to tag yourself, head over and let her know. Can You Tell That Average Jane Is Not In Work Mode? One of these days, I'll post some photos from my new camera. I'm just too lazy right now. If you're a Kansas City area blogger who's getting as tired of sitting on the couch as I am, come out to a Blogger Meetup tomorrow from 4:30 p.m. to whenever. For the rest of you, I promise some sort of semi-legitimate post soon. I meant to post earlier, but I was too busy treating myself to the laziest day I've had in as long as I can remember. I woke up early and took my car to the dealer for a recall repair. While I was waiting, I started reading Special Topics in Calamity Physics. I read for more than an hour at the dealership, then returned home and after a brief trip to the bagel shop with my husband to keep him company as he ate breakfast, I settled onto the couch determined to read the rest. All day long I read for long stretches, stopping occasionally to eat small meals and snacks (leftover minestrone, a pastrami sandwich, an orange, and a ramekin of leftover chocolate pot d'creme from Christmas Eve). Now and then I'd put the book down and nap for a while with cats piled all over me. It's now a little after 7:00 p.m. and I just read the last page. I'd chosen the book for a book club and was pleased to discover that it was really, really good and full of surprises. I can't wait to discuss it with everyone else, but our meeting has been postponed until the Sunday after next. As you might gather from my account of today's activities, Christmas Day was a little more strenuous. I loaded my car with food and gifts around 9:30 a.m. and headed to my sister's house. We spent the morning preparing snacks and drinking mimosas. The rest of the guests arrived between noon and one, and we spent the afternoon opening gifts, eating dinner and chatting. This was a year of lavish gifts from friends and family alike. My husband got me a new Pentax digital camera that's small enough to tuck into my purse. It takes gorgeous photos and I'm really looking forward to having it handy whenever I spot something I'd like to photograph. I got tons of books: "I Like You" by Amy Sedaris, "Born Standing Up" by Steve Martin, "Baking" by Dorie Greenspan, "Mortification: Writers' Stories of Their Public Shame" edited by Robin Robertson, "Full Frontal Feminism" by Jessica Valenti, and "How to Write Great Songs" by Michael Heatley and Alan Brown. I also received a cool checkmark-shaped bookshelf from my sister, which will obviously come in handy. I got two calendars: a Far Side desk calendar which will be useful for work, and a 2008 George Bush Out of Office Countdown wall calendar. Clearly, my friends can read my mind. The gift list doesn't stop there. It also includes a retro rock themed t-shirt, a nice sweater, a beautiful art glass necklace, a gift set of Fresh Lemon Sugar lotion, cologne and shower gel, and some tangerine-scented soap. I was rather dumbfounded to get so much stuff at the end of a year that's been so financially rough for most people. To everyone who bought me such thoughtful gifts: I'll enjoy every one to the fullest. I hope everyone had an enjoyable holiday. Have any good stories about yours? 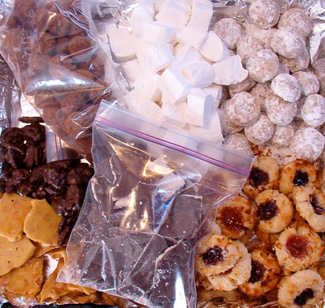 Clockwise from upper left: bourbon balls, marshmallows, pecan butter cookies, jam thumbprint cookies, peppermint bark, peanut brittle and toasted pecans covered in chocolate. All the gifts have been wrapped, I've made multiple pounds of candy and cookies, and today I'm prepared to make rolls for tomorrow's feast. Since everything is under control, I'll finally do the holiday meme that I've been seeing around for the past week or so. I love real trees, but we've had an artificial tree for the past five or six years that's tall, narrow and fits perfectly into the corner of our small living room. Ordinarily it would be Thanksgiving weekend or perhaps the weekend after. However, this year I didn't put it up at all. Ugh. No way. My dad used to make eggnog pancakes at Christmastime when we were kids and I didn't even like it that way. I still remember my first Malibu Barbie. I thought she was pretty cool. No, but my sister has the ceramic one we made when we were kids. I really can't discuss the all-time worst, but there have been some notably bad Christmas sweatshirts and other crafty items over the years. I fully intend to mail some Christmas cards between now and the beginning of 2008. I listed my top five on Lazy Eye Theatre earlier this week: A Christmas Story, Elf, Bad Santa, National Lampoon's Christmas Vacation and Gremlins. Around Thanksgiving or sometimes slightly before that. All of the rellies live within 30 minutes of me, so it's more of a commute than travel. Can you name all of Santa’s reindeer. Dasher, Dancer, Prancer, Vixen, Comet, Cupid, Donner, Blitzen, Rudolph. I prefer a star, but as I've mentioned before, I happen to have an angel that reminds me of Celine Dion. Open the presents Christmas Eve or Christmas morning? My husband and I almost never wait until Christmas Day to open our gifts to each other. However, all of the rest are opened on Christmas Day. The way people drive - it's even worse than usual right now. Do you decorate your tree in any specific theme or color? No, it's a mishmash of ornaments that have been given to me or caught my eye over the years. Santa doesn't stop by our house; we're too old and he doesn't think our cats count as kids. Oh, how can I choose just one? "Santa Baby" is definitely on the list, as is "Do They Know It's Christmas," which I've found annoying and patronizing since it debuted. I could go on and on. I have a lot of favorites: a pirate ship, a robot, a martini glass, the die-shaped one from Vegas that I bought when we renewed our vows...there are probably lots more that I won't remember until I get the ornaments out again (next year, if all goes well). Have a lovely holiday! I'm giving myself a day off from posting tomorrow, but I'll be back on Wednesday with my Loot Report. Thanks for reminding me every single day that I can still get gifts from you before Christmas. I hate to hold a grudge, but I just can't get past that Christmas in 1998 - you know, during the height of the first dotcom boom, when I ordered a whole bunch of gifts from you and they never arrived. Yes, you gave me $100 in gift certificates, which was the right thing to do. But you know what they say: once bitten, twice shy. You're a shining example of why online and offline retailing need some database convergence. Your daily e-mails hint at some desperation at my failure to buy from you this holiday season. However, I actually dropped a significant amount of money at one of your retail stores a couple of weeks ago. Thanks for checking in, though! I know you're perfectly well aware of how much I've spent with you this holiday season. Yet the e-mails continue daily, even though we both know it's too late for me to order anything else and get it on time. C'mon, don't be greedy. You don't want to end up like VistaPrint, from whose e-mail list I finally unsubscribed because they had no boundaries whatsoever. Just a friendly warning. Here's a quiz from the Chicago Tribune: So you think you know carols? I got 92%, which I thought was pretty good considering that there are a few wildcards in there. Take the quiz and tell me how you did! I'm picking up a nice meme I found at Raspberry Latte. Rules: Paste the first line of your first post for each month, starting with January 2007. Like her, I decided to link in case anyone was feeling nostalgic. January - Welcome to 2007! Hope it's going well for you so far. February - There's a simple little meme going around with the theme, "When did you lose your Amazon virginity?" March - When I went to bed last night, I thought that a few rain-catching bowls on the living room floor would be the worst symptom of the storm. April - Just in time for April Fool's Day, we learn that a Derbyshire resident (who wishes to remain anonymous - what are the odds?!) has discovered a mummified fairy. May - My husband and I went to a concert at a nightclub last night. June - I'm not much of a fan of Florida. July - My pre-birthday trip this weekend was absolutely wonderful. August - Yesterday was my first whirlwind day of the Ford Great Escape blogger extravaganza. September - So my cover band had its first gig on Saturday night. October - Late Sunday afternoon, I had a moment where I was convinced that it was only Saturday. November - Last night was Burrito Night at our house, so I decided to treat myself to a couple bottles of Jarritos soda at the grocery store. December - Look at this - I've gotten so conditioned to post daily that here I am posting on a Saturday. That was fun! Let me know if you decide to do the same thing. I almost forgot that the Internets had my family sugar cookie recipe until I saw a link from it in my stats the other day. I entered it in a sugar cookie contest on Velcrometer in 2004 and actually won (although, now that I think about it, I never received my prize). But anyway, it's a good, basic sugar cookie recipe and worth sharing at this time of year. In fact, I'll probably make some this weekend. If I do, I'll post a photo of my crazy drawer full of cookie cutters. My collection, augmented by a couple of eBay auction wins many years ago, is a bit beyond what most sane people would have. Cream butter and sugar together, then add eggs and vanilla, followed by the dry ingredients. Blend well and roll out on floured board. Cut with cookie cutters. Sprinkle with colored sugar, if desired. Bake at 350 degrees Fahrenheit for 8 to 10 minutes. These can be iced (if you skipped the colored sugar), but I like them pretty well just plain. The ones in the photo have been rolled out very thin (I highly recommend the Norpro Pastry Frame), but these are good a little thicker as well. With the exception of one last gift that I need to purchase for our guitarist, who won't be coming over until Thursday, I'm finished with all of my holiday shopping. I finked out a little with a big group of friends and got a lot of them the same thing, but I think it's better to get any gift than not get a gift, isn't it? Tonight I need to wrap all of the friend gifts because I'll be dropping them off Wednesday evening on my way from the airport to band practice. That's right, I can't even go to the party and watch people open their gifts because I'm too busy. Bah humbug. Then I just need to wrap the family gifts, but I'm holding off as long as possible because Xena has already stolen one bow and riddled it with tooth holes. I decided to call a halt to my shopping because I was starting to get to the "just one more" stage with a couple of people. Of course, as my sister pointed out, it's not a contest. There's no real point in piling yet another gift on the stack for someone - particularly when there are regular bills to be paid this month, too. If you do the Christmas thing, are you finished shopping yet? It snowed all day Friday and Saturday, so I ended up clomping around in my heavy combat boots all weekend long. I have a pair of Skechers that have lasted me so many seasons that I just replaced the laces for the second time. On Friday evening, my husband and I picked up my niece and took her to Red Robin for dinner. When we got home, we baked brownies (minus the coconut because my niece doesn't like it, and the chocolate chips because I didn't have any). I went ahead and gave her the "My Neighbor Totoro" DVD and we both enjoyed it a great deal. It's nothing like most American animated movies: moody, atmospheric, villain-free and quite realistic in the way the characters interacted with one another. The totoros and the cat bus were an awesome combination of cool and a little bit scary. We ended up watching it again the next morning and I could tell that my niece was casting about for someone to watch it with her one more time when she got home on Saturday evening. Even though it continued snowing all day Saturday, my niece and I still drove all over town and got our holiday shopping done. (Well, I'm almost done, but we got hers taken care of.) I did a big bunch of my shopping at World Market and she got presents for my sister, brother-in-law and nephew at Target. We went back to my house and wrapped everything in the only wrapping paper I could find: two rolls of robot-print paper from Old Navy, and one leftover roll of more traditional paper that I've been working on for a couple of years now. I'm pretty sure I have two more rolls somewhere else, but I couldn't find them. I'm hoping I can make these stretch so that I don't have to buy any more this season. On Sunday, I volunteered at the low cost spay/neuter clinic all day. It went pretty well until my last cat, a pretty long-haired young tabby female. She took her time waking up from the anesthetic, so once I was down to just her, I decided to hold her in my arms for a while. Big mistake. While I was walking around with her, she ended up peeing all over me. By the time I noticed, I had a big trail of cat pee down my side starting at my shirttail, going down the seam of my jeans and pooling on my boot. Lovely. I cleaned off as well as I could and the cat still didn't wake up for another 45 minutes. After I finally put her back in her carrier, cleaned off the table and left the clinic, I had to stop at Costco for some groceries. I considered skipping it, but I needed a bunch of stuff, so I went ahead and did my shopping, hoping fervently that I didn't reek of cat. If it had been a male cat, I probably would have had no choice but to head home. When I got home, my cats were very interested in my boots, even though I'd swabbed them down with alcohol. I took the rest of my clothes and threw them straight into the washer. OxiClean took care of both the cat pee and the blood I'd gotten on my shirt from another cat. Just a little consumer tip for you in case you ever happen to have blood stains you need to remove from your laundry.